There is much work to be done on a song before it is ready for public view and everyone develops their own process. Here I’ll share a little bit of mine. I’ve gathered these questions from many places (acting classes, song performance classes, articles, voice lessons, books, etc.). This list does not stand in for the whole process of crafting a song performance (for me, this requires a much longer list and the help of many talented and supportive people!). But, this most basic set of questions reminds me that I have a specific reason to sing this song today. I have something to say. I have a story to tell. What just happened/What are you responding to? How are you doing this, using what means/actions? What obstacles/dangers must you surmount to achieve this goal? This list is just a starting point. Feel free to change it to suit your needs! 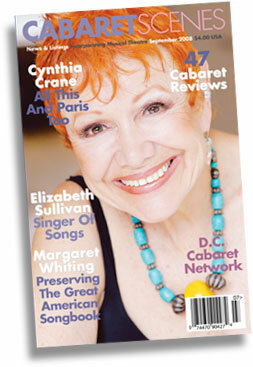 A two-page article profiling the DC Cabaret Network appears in the current issue of Cabaret Scenes magazine. Written by DC Cabaret Network member Michael Miyazaki, the article gives some of the history of the Network and describes the current activities of the organization. And the headline “DC Cabaret Network” even appears on the cover of the magazine. This is a particular honor for the DC Cabaret Network as this is the first profile of a regional cabaret organization that the publication has featured — ahead of profiles of our counterparts in Chicago , California, and Boston . The current issue can be ordered from Cabaret Scenes either as part of a subscription or as a single issue @ www.cabaretscenes.org. Cabaret Scenes, in print since 1996, is the magazine of record for the U.S cabaret scene, with correspondents in New York City , Boston , Chicago , Las Vegas , Los Angeles , Palm Springs , Philadelphia/New Hope and Washington , DC . In addition to publishing performances reviews from across the country, each issue features interviews with cabaret professionals (performers, songwriters, club owners), CD reviews, music al theater reviews, and “Spotlight On” stories about clubs and cabaret organizations around the country. 1. Make copies and give those rather than having to fight with a large book that won’t stay open. 2. Make sure the copies are complete with nothing cut off from top or bottom. Using a zoom percentage of 92% or 93% works perfectly. 3. Loose copies are oh-so-much better than ones that are stapled. 4. If you want to connect the copies, put them in a 3-ring binder — no need to back-to-back them for now. Or tape them all together in one long, continuous chain. Personally, I like the binder way better. 5. DON’T PUT THE COPIES IN THOSE PLASTIC SHEET PROTECTORS. NOT JUST YET. They’re impossible to mark without a hassle. 6. Once the musical arrangement is set, plastic protectors are fine. But make sure they are the NON-GLARE type. Yes, a little more expensive, but nothing quite so impossible to read as music with a strong glare coming off it. Do remember to pay your dues! It’s “Back to School” and time to renew your membership with the DC Cabaret Network. Don’t forget to pay your dues! 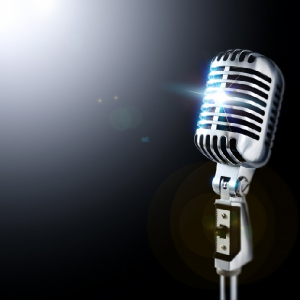 The DC Cabaret Network’s monthly Open Mic Night is Monday, September 22 @ 7:30 p.m., and we’ll still be singing our hearts out at the Warehouse Theater. Sign up starts at 7:30 p.m., singing begins at 8:00 p.m. 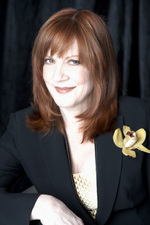 The delightful Mary Sugar will be at the piano. But don’t worry: you don’t HAVE to sing. 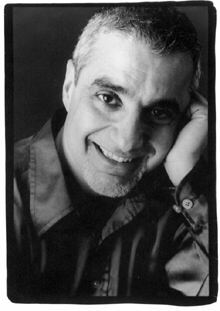 We love having cabaret patrons in the audience who want to enjoy a delightful evening of cabaret music. We hope to see you there! Admission for all is a suggested donation for the pianist and to cover the rental fee: $15 for non-members, $12 for paid members of the DC Cabaret Network.